MARTINSVILLE, N.J. (October 18, 2011)—Lottery Post, the world's largest community of lottery players and home of the Internet's most popular lottery results service, announced today the launch of its latest industry-leading innovation: current and past lottery prize payout results for all of the hundreds of lottery games shown at the Lottery Post Web site, on both computers and smartphones, such as iPhone and Android. Although the 'winning numbers' portion of lottery results are published in a variety publications, both online and offline, the actual prizes that can be won by matching various number combinations has been notoriously absent from those same publications. Lottery players wanting to find out how much they won can become frustrated by the lack of available information. In most cases, players can eventually track down the prize payouts at their government lottery Web site, but until now there hasn't been a single Web site or publication a lottery player can use to find prize payouts for all lotteries. Compounding the problem, although many government Web sites maintain a history of winning lottery numbers, very few allow lottery players to view historical prize payout information. With today's announcement, Lottery Post (www.lotterypost.com) aims to help lottery players immediately overcome these and other challenges, providing access to both current and past prize payout information for all lottery games at its Web site. "This is an exciting day for Lottery Post, as we can finally share details about the wealth of information provided by this project, which has been in the works for several years," said Todd Northrop, Founder and CEO of Lottery Post. "Prize payout information is easily the most requested feature we hear from lottery players, and we couldn't be happier to finally be able to deliver it to them." Also being announced by Lottery Post today is the broadening of access to Lottery Post's renowned lottery results database, to allow any Web visitor to see the entire past year of winning numbers and prize payouts, without restriction. "The move to unfettered access to the entire past year of winning numbers and prize payouts creates an incredible resource and efficiency for both daily and casual lottery players, who want quick and reliable access to check their lottery tickets," Northrop explained. "Access to one year of data is the perfect amount of time, because it is the longest span of time for which a lottery ticket can be valid before it expires." Northrop continued, "Lottery Post currently is the most popular Internet destination for lottery results, and as such we feel a responsibility to the lottery players we serve to give them the highest quality and most reliable information. And now we are the only place where lottery players can find the complete information they seek, including prize payouts for each game." Lottery results and prize payouts can be found at Lottery Post by visiting www.lotterypost.com/results in a computer Web browser or on a smartphone, such as iPhone or Android. The endeavor to bring prize payouts to Lottery Post caps a six-year planning and data collection effort, during which Lottery Post implemented its own lottery results publication service and data feed, and rapidly ascended in Web traffic popularity to become the industry's top destination for lottery players seeking the latest winning numbers. Mr. Northrop also authors and publishes Lottery Results Almanac books at the start of each year, chronicling the winning lottery numbers for each game during the past year. United States and Canada editions of the Lottery Results Almanac have been published for the past two years, and are planned again for publication in January, 2012. The 2010 United States edition is currently available at Amazon.com by visiting http://amzn.to/hOlZON. Lottery Post (www.lotterypost.com) is the Internet's largest community of lottery players, with discussion forums, daily lottery news, lottery results (winning numbers), prize payout information, predictions, lottery systems, and more. 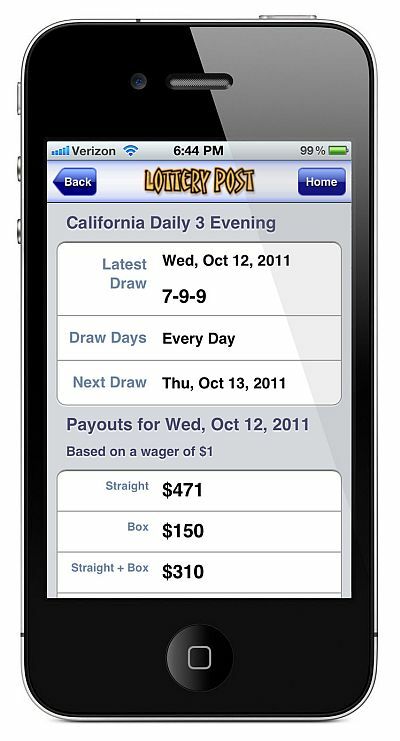 Since 2000, Lottery Post and sibling web site USA Mega (www.usamega.com) have been providing accurate, player-friendly information and interactivity for lottery players worldwide.